Panting and breathless (for various reasons) from Mary Cavanagh's coffee and light reading event, followed by storytime (only one taker, but an important one - Ali and her son Johnny) we welcomed Jonathan Drapes to the shop Wednesday evening. 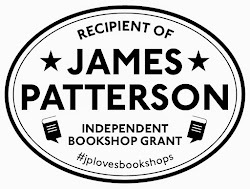 Being completely honest about this (as we always try to be, to give you a realistic impression of what it's like to run a bookshop) we had had few takers come the Tuesday night, which was a bit gutting for us and Jonathan. Whether it was the time of year, the fact that we'd done a few events of late, I'm not sure. Anyway, I'd chatted with Jonathan on the phone, and with hopes of our podcasting technology being up and running, we'd decided on going ahead with the event anyway. I'm very glad we did - it was one of the best events we've run. Jonathan and his girlfriend Katherine arrived just after 7pm, and we got started at 7.30pm. 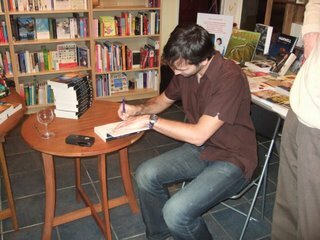 We dispensed with the tables, and just drew the chairs around, poured out some wine, and discussed the book and his experiences as a new author. The story of how Never Admit To Beige got published is a good one. The book is published by Macmillan New Writing (MNW), an innovative imprint of Macmillan that has attracted a good deal of attention in publishing circles (and a lot of criticisms, mostly by agents - but more about that in a moment). It's fair to say that Never Admit To Beige (NATB) is the most successful (in terms of coverage) of all the books in the imprint so far (I'm sure I'll get some comments disproving this - my view only I hasten to add). NATB was originally written 9 years ago, in Australia, and Jonathan found an agent very quickly. Thinking that "this publishing lark is a doddle" (or words to that effect) he went travelling, whilst the agent totally failed to place the novel, then got sick, then retired. Jonathan returned to find he was back to square one. Fast forward a few years, and Jonathan had travelled to England, where he hit on the idea of recasting the protagonist as an Englishman, not an Australian - in one of those eureka moments that made the book much stronger. Much of the action takes place on Australia's Gold Coast, a place Jonathan knows well and loves, and placing a bumbling Englishman into this exotic location suddenly threw up plenty of potential for the kinds of misunderstandings and fish-out-of-water gags that NATB delivers very well indeed. Jonathan submitted the revised MS to approximately 40 agents - before chancing upon the Macmillan website. Jonathan submitted his MS directly (MNW accepted manuscripts by email - what a radical concept!) and what followed was a relatively smooth route to the eventual launch at the beginning of December. Jonathan was very honest about his experience with MNW - and Macmillan seem to deserve a lot of credit for trying (and succeeding) to do something both innovative and imaginative, which really does benefit new writers. (If you are interested in some of the fuss that accompanied its launch, check out this post from Grumpy Old Bookman and some of the later posts). Jonathan answered a whole range of questions about the book, and his writing. Was he a full-time writer (unfortunately not), did he write the book with a view on the film (yes, and the name Doug McAvoy was mentioned), is he writing a new book (yes, but not a follow-up, and maybe a change of style - although this was the subject of some debate between him and Katherine!). He described his slightly freaky experience of appearing on the Simon Mayo show on Radio 5 (his book was selected as book of the month back in December), and we even had a healthy debate on the cover design. 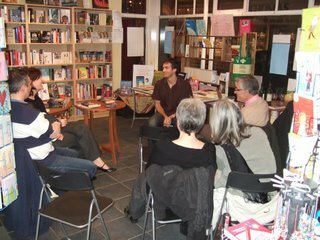 So, having spent a highly enjoyable hour kicking back with the author, Jonathan signed some books, we welcomed a few late arrivals (including one person out on a post-prandial stroll who popped in because 'it looked like we were having fun') and everyone finally said goodbye at about half past nine. We definitely need to do more events like this one. NATB is a really quality piece of writing, genuinely funny, very original and slips down easily (no, I'm getting dangerously close to a v. poor Australian lager comparison - I will stop there). I'm sure regular readers of this blog probably get a bit fed up with me describing authors as "nice" or "decent" or " very nice". I got all gushy over Sophie Grigson, and Sam Jordison was a delight to have in the shop. But it's true - and now I'll have to add Jonathan to this niceness hall of fame. 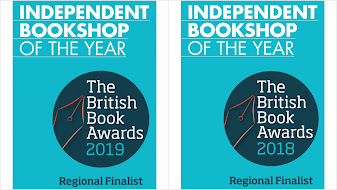 Thanks very much to Jonathan and Katherine for making the journey down to the shop, and we look forward to NATB getting the wider promotion and readers that it deserves. And of course - we have signed copies now on the shelf. Just wanted to say a huge thank you to Mark and Nicki for having me. 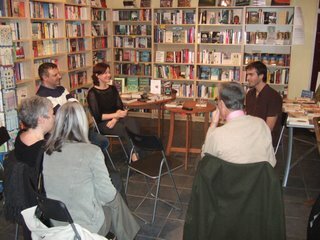 The event was a lot of fun and Mostly Books is the sort of book store that gets you excited about writing in the first place. My sincere apologies to the actor Doug McAvoy - if such an actor exists - but I think we all agreed on James McAvoy if the book ever makes it to film. I'm sure they can find a part for Doug, though. 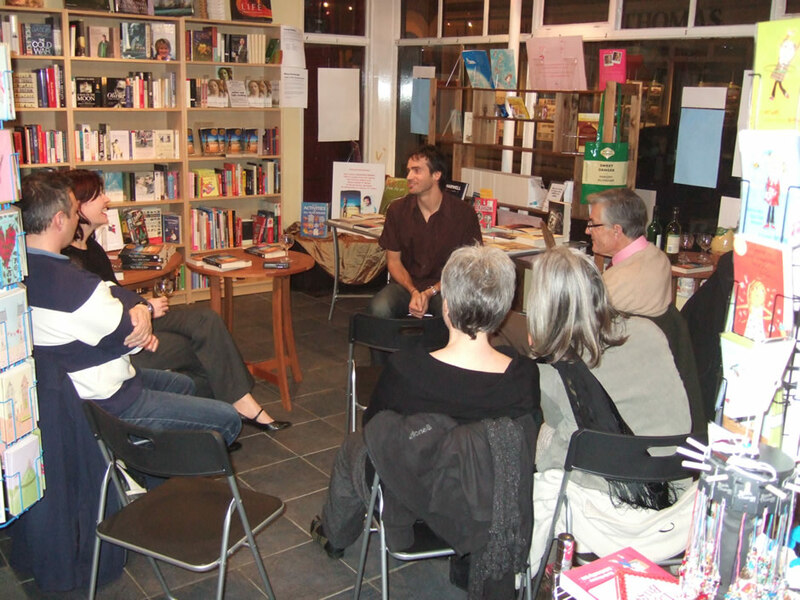 Great to see you supporting new writers at the bookshop! Excellent. I was very interested to hear about Jonathan's book, which I plan to get my hands on. I heard him on Radio Five and thought that's something to watch out for. It sounds like things are going well for you there at Mostly Books.